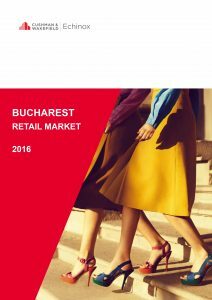 The modern retail stock in Bucharest reached 1.225 mil. sq. m at the end of 2016 and consists especially in shopping centres (56%) and retail parks (33%), while commercial galleries cover the remaining 11%. Last year new supply reached 98,500 sq. m, after the openings of Parklake Plaza and Veranda Shopping Center and the extension of Militari Shopping retail park. The average density of modern retail space reached 650 sq. m / 1,000 inhabitants. 1 st District of Bucharest, which is also the wealthiest, has the highest density, with 961 sq. m / 1,000 inhabitants, but also the highest occupancy rate (99%) and the highest headline rent, with € 75 per sq. m / month. The 6 th District of Bucharest continues to have the largest retail stock, with 301,800 sq. m, while the 3 rd District advanced on the second position after the opening of Parklake Plaza, with 270,400 sq. m.
For 2017 no major retail project is scheduled for completion. The current pipeline is limited and consists of the extension of retail schemes such as AFI Palace Cotroceni and Promenada Mall. Starting 2018, however, the situation is likely to change, since currently in the northern part of the city some projects are in early stages of development.